Mara and recently acquired friends her ‘keys’ to doing the move from city to country successfully. 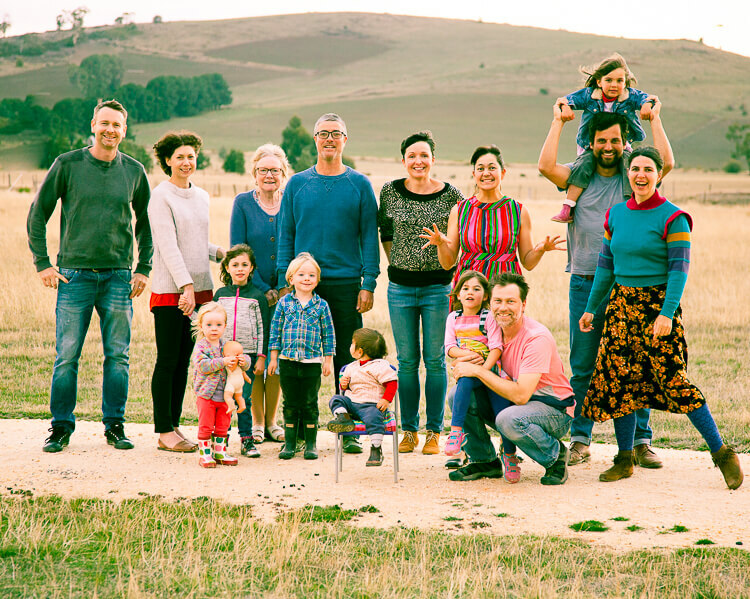 Not long after purchasing our land, on Radio National, I heard an interview with Tammi Jonas from Jonai farm and discovered my neighbour was a free range pork producer (read all about Tammi in the latest issue of Pip). Immediately I emailed her and expressed pure joy at having her as my neighbour. I signed up to Jonai’s Community Supported Agriculture Deliveries and now bask in the pleasure of her produce. Around that time our family had dropped in on Captain’s Creek Organic Farm for a drink, a five minute drive from our new home and discovered their organic produce box. Today once a week at our front door arrive vegetables in a film of volcanic goodness. Moving to the country, I feared I would never ride my bike again. The Calder Highway with its lengthy steep ascents was not for me. I decided I would door knock Daylesford locals to ask for a bike adobe. If I could park my bike on the edge of town then an agreeable bike riding distance could be achieved. Well before door knocking took place one of our builders offered to host my Yuba Mondo at his partners gorgeous permaculture house. I was eager to meet as many locals as possible. In Melbourne I had cultivated a strong and wonderful community. It was rare for me to venture out and not bump into someone I knew. I thrive on community and on daily interactions with both strangers and those I know well. By dropping in on neighbours along my street I met Mara, a circus performer and permaculture gardener, Carol a conservationist and animal rescue carer and Danny a young farmer making Portuguese tarts with home grown eggs and delicious pork panini. It occurred to me that the value of our land was far greater than what we had paid, as our neighbours were priceless! At a book launch at the Daylesford Community Gardens I met authors and bike enthusiasts Meg and Patrick (Pip Magazine’s resident weed expert). During drinks a gorgeous woman introduced herself and on finding that I was new suggested we have coffee together the next day. At her home we entangled ourselves in sourdough bread baking stories and I ate her flavour saturated dried fruit as we promised to see each other at the opening of the Creswick Farmers Arms. Within a short period of time I had found community and begun rewarding friendships, and now I feel the comfort that comes from knowing my neighbours are caring open minded people striving to improve the world. My bike is at hand but my gardening is slow. So for the moment that is what I am focussing on, as trees take a long time, and with few herbs and no quince tree to harvest in May, life is simply a little less tasty, but full of friends!